We have listed the top San Jose del Cabo sport fishing charters and rentals locally recognized. Puerto Los Cabos is situated on 2000 acres of property, east of San Jose del Cabo on the Baja California Peninsula, and encompasses over 3 miles of beachfront. Located just minutes form the historic district of San Jose del Cabo, Puerto Los Cabos is ideally situated only 10 minutes from Los Cabos International Airport (SJD), and only 40 minutes from Cabo San Lucas. 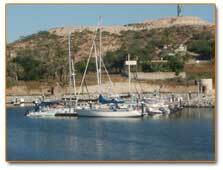 The San Jose del Cabo sport fishing is when of the top sportfishing areas in the world. The top tournaments use these fishing grounds to hunt for the million dollar fish that frequent the Gordo Bank’s and surrounding areas that attract the greatest game fish from the pacific. Blue marlin, Black Marlin, stripped marlin, sword fish, Sail fish, Wahoo, and tuna to mention the Local favorites. Please enjoy the selection of San Jose del Cabo sport fishing fleet selections. We have to offer, and please don´t hesitate to mention your sportfishing favorites. Also visit Cabo san lucas sportfishing charters for the top fishing charters in the Local area.